Trolls may thrive on anonymity, but there are plenty of other reasons for wanting an online pseudonym. Internet trolls tend to lose their bravado if their anonymity is pierced – at least that’s what happened when professor Mary Beard threatened to forward a troll’s attack to his mother. It’s in all our interest to clean up abusive or threatening behaviour in these internet streets, and insisting on people using their real names is one way to do this. “Online, I use my real name for many things. But sometimes, I prefer to use a pseudonym,” Judith Donath wrote in Wired. “I simply want to manage the impression I make, while still participating in diverse conversations and communities.” Donath points out how nothing you say on the internet really disappears, and sometimes it’s nice to have an online exchange that’s more similar to in-person conversations: just a casual chat, and not something that’s tied to your name for eternity. This kind of reasoning may well be why anonymous messaging app Yik Yak is now valued at US$300-400 million, following three rounds of fundraising over the past year. Yik Yak lets people talk anonymously to others in close geographical proximity, such as college campuses or neighbourhoods. While Twitter and Facebook has cornered the market on spreading news, Yik Yak might be able to fulfil a similar function for local events. Two other apps, Whisper and Secret, have a similar function, but are aimed towards sharing personal confessions. If it’s truly possible to be anonymous when using a communication app, these could be a powerful tool for political activists in countries with oppressive governments. This autumn, Hong Kong protesters took to off-the-grid communication app FireChat to coordinate their activities. FireChat works by creating its own network between users, relying on Bluetooth or WiFi links to connect users’ phones. FireChat messages are also open for everyone to see, enabling mass communication not dissimilar to Twitter, while at the same time being more secure than the likes of Whatsapp, which is linked to users’ phone numbers. 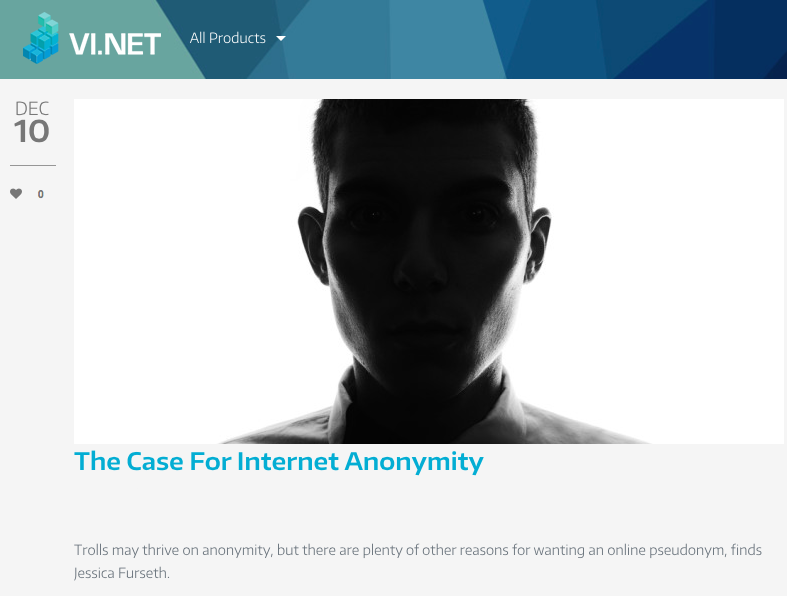 Though often, internet users don’t actually need to be completely anonymous. We might not mind giving our real name when registering for a service, but still want a screen name for interacting with other users. In the fight against online trolling, this could be a good compromise as it allows discretion, but ensures people traceable if they become abusive. “The consequences of losing the ability to use Facebook with a chosen name are far worse for some. For trans women, who make up 72% of the victims of anti-LGBTQ homicide, being forced to reveal their birth names can be deadly,” Nadia Kayyali wrote in the San Francisco Bay Guardian. Stage performers most commonly known for their stage names were among those falling foul of Facebook’s policy, as well as people who may want to talk about sensitive issues without risking discrimination at work. Kayyali also pointed out how people hiding from abusive relationships often use pseudonyms to seek support on social media. Facebook has since softened its name policy, and apologised: “The spirit of our policy is that everyone on Facebook uses the authentic name they use in real life,” said Chief Product Officer Chris Cox, adding that the network wants to improve “the safety and authenticity of the Facebook experience for everyone“. Posted on 02/10/2015 by Jess. This entry was posted in Technology features and tagged anonymity, internet. Bookmark the permalink.